So, after the great sock debacle of 2011 caused by yours truly having a pretty nonsensical idea of how big my dad’s feet are, I decided to try again. Cause I do not accept defeat. I have quit things I did not like for perfectly valid reasons, but I do not quit. TH (the husband) has encouraged my thinking I can do anything I put my mind to by inspiring me to watch movies like Road Trip. …and so, ladies and gentlemen, I found something to relate my dad’s foot size to….TH’s foot size. TH and my dad have VERY similarly sized feet, so, if I make a sock big enough to fit TH, I should be in the money. Now, it turns out that these men have much bigger feet than I do. 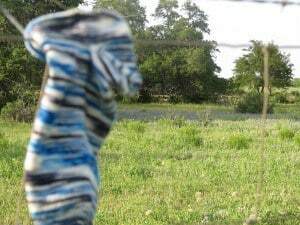 I was SHOCKED at how big I had to make the sock to get it to fit him. I mean, he’s not a small guy, think Viking, and my dad has a sturdy frame too, but my gosh! I never realized how flipping large their feet are…or how much knitting would be required. I was mollified that TH was shocked by the size too. 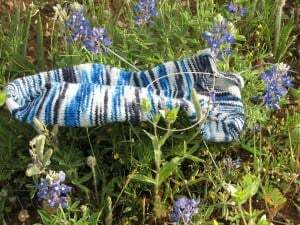 The good news is that a. I have pretty bluebonnet pics of a sock in progress and b. if the socks don’t fit my dad or he just doesn’t like the yarn colorway, TH is going to have a nice new pair of handknit socks. And there are few things I love more than a solid plan B. My whole life seems to be a solid Plan B sometimes. I’d be willing to bet your dad will love the yarn. Love it. I’m semi-irritated that the second sock is not going to really match the first sock per se, but that’s what happens when you hand knit socks sometimes…we shall see!